Boomerangs are traditional Australian Aboriginal Cultural objects which are sold as souvenirs to tourists. So too are bullroarers and didgeridoos. According to Justice Perry, consumers are entitled to assume they are made in Australia because they are Australian Cultural Objects. If they are made elsewhere, the place they are made must be clearly labelled, otherwise, the souvenir seller may face prosecution for selling a fake. And if the label says ‘hand painted’, then an Aboriginal person must have done or supervised the painting. The decision is Australian Competition and Consumer Commission v Birubi Art Pty Ltd  FCA 1595 (23 October 2018), Federal Court of Australia. Over the period 1 July 2015 and 14 November 2017, Birubi Art sold 18,000 objects (boomerangs, bullroarers, didgeridoos and message stones) which contained visual images, symbols and styles of Australian Aboriginal art to approximately 152 retail outlets across Australia. The Court found that these objects and their labels conveyed the overwhelming impression to the buying public that the objects were made in Australia and were hand painted by an Australian Aboriginal. In fact, the objects were made in Indonesia, and no Australian Aboriginal person was involved in their manufacture. The objects had no country of origin label. Even if they had, it is unlikely to have altered the impression. What impression did the boomerangs and other objects convey to the public? A boomerang is readily recognisable as a traditional Australian Aboriginal Cultural object, in this case featuring visual images characteristic of Australian Aboriginal art as painted by Australian Aboriginal artists. 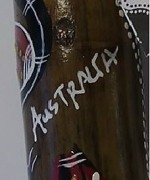 The word “AUSTRALIA” is painted in a freehand style onto the back. There is artwork of a man playing didgeridoo. There is nothing inherent to indicate that it is mass-produced – it looks hand painted. It is not identified as having been made in Indonesia. 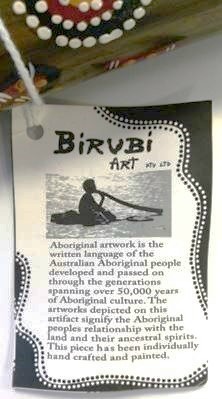 “quality Australian souvenirs, genuine Aboriginal art…”. Other labels on the box state: “hand made”, “royalties are paid” and 100% hand painted”. The bullroarer, labelling and packaging conveyed the same impression as the boxed boomerangs. 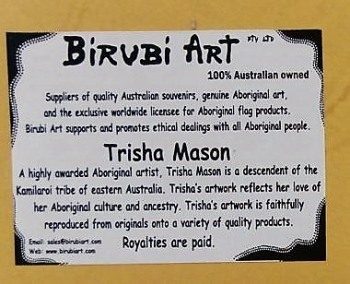 In addition, the Australian Aboriginal artist Trisha Mason is identified as the artist whose designs are used for the bullroarer, and to whom royalties are paid. On the label is “individually hand crafted and painted”. 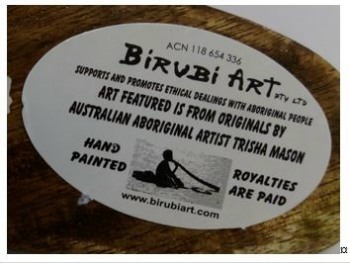 There is a description of Birubi Art as a “wholly Australian owned company specialising in hand painted Australian artefacts…”. The message stones are not as recognisable Australian Aboriginal Cultural objects, did not convey the same impression, and the label simply states: “ABORIGINAL ART” and “HAND PAINTED”. The Court found these representations were conveyed: made in Australia and hand painted by an Australian Aboriginal. They were not expressly stated, they were implied by impression from images and words on the objects, the labelling and packaging. the products were made in Australia – which was misleading and deceptive conduct in breach of s 18 and a misleading representation as to the place of origin of goods in breach of s 29(1)(k). and were liable to be misled because of that familiarity. The words and symbols were literally true: for example ‘hand painted’. The Court said that it was the retail environment in which the products were displayed for sale that conveyed the misleading impression that the artefact was ‘hand painted by Aboriginal persons’. Commercially, most souvenirs sold in Australia are sourced from overseas (primarily Asia) because they are cheaper to make than in Australia. The Federal Court has now drawn a line - traditional Australian Aboriginal Cultural objects (boomerangs, bullroarers and didgeridoos) must be sourced within Australia because consumers make that assumption, unless they are clearly labelled as sourced elsewhere (usually Indonesia or Vietnam). And if described as ‘hand painted’, they must be hand painted by an Australian Aboriginal person. The proceedings will now return to Court for orders to be made. These orders normally include an injunction, civil penalties, a disclosure order, a compliance program and a legal costs order. However, the further orders may be academic because a few days after the decision was handed down, a liquidator was appointed to Birubi Art Pty Ltd (In Liquidation) by its shareholders. This means that it will cease to carry on business. Whether the ACCC seeks orders against Mr Wooster, the sole director, remains to be seen. Tourism represented 3.2% of Australia's GDP in the financial year 2016/17, contributing A$47.5 billion to the national economy. There were 8.8 million tourist arrivals in 2017. Previous research suggests that expenditure on shopping comprises almost a third of the total travel spend. Purchasing souvenirs is an essential part of the travel and shopping experience for international visitors and tourists. Souvenir purchases allow the visitor to ‘capture the travel experience’ and take it home with them to make the experience tangible; share the experience with others; and remind themselves of the experience long after they have returned home. Unlike stuffed koalas and kangaroos, or fridge magnets depicting the opera house, it is entirely reasonable for a visiting tourist to expect that cultural artefacts displayed for sale as ‘hand painted by Australian Aboriginal persons’, to be genuine. It would mislead the tourist and devalue their experience if the boomerang, bullroarer or didgeridoo was made in Indonesia, but sold as Australian made. The ACCC is right to pursue this.